Tell 'em EXACTLY why you're mad! Seattle Seahawks free safety Earl Thomas got injured during Sunday's gama against the Arizona Cardinals. And to say he was mad about the injury would be an understatment. During the fourth quarter of Seattle's win (20-17) over Arizona, Earl Thomas suffered a season-ending injury to his left leg. Seahawks' coach Pete Caroll confirmed his injury is a lower leg fracture and that Earl believes it's similar to a season-ending injury he suffered to the SAME leg in December 2016. Damn. 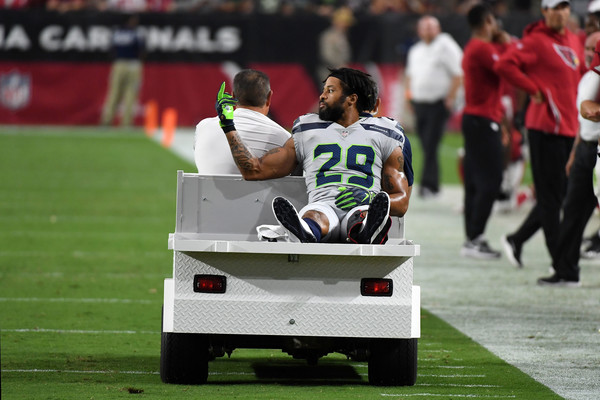 As he was being wheeled off the field into the locker room, the injured NFLer was so angry and frustrated he flipped the bird towards the Seahawks' sideline. Makes perfect sense. And what makes matters worse is that the Cowboys and the Chiefs were looking to acquire Thomas before the October 30th deadline. Before the season stated, Earl was holding out on returning to the Seahawks due to not receiving a contract extension. "He knew exactly what had happened to him. He went right to what it's going to take to get back … and this is emotional as you can get, but he was very chilled about it on the field," Carroll said. "He was an unbelievable stud about handling it. So give him a little slack. This is a very, very difficult moment that most people would never understand what this is about." So yeah, the All-Pro safety is done for the regular season. Get well soon! 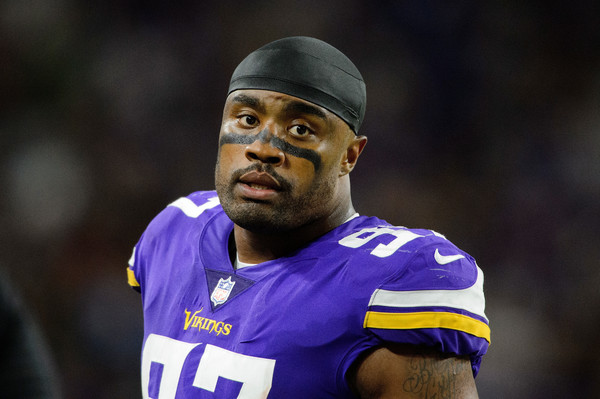 Minnesota Vikings defensive end Everson Griffen is going under mental evaluation after a bizarre insicident with a gun at a hotel. It's being reported he could possibly be showing early signs of CTE. Chronic Traumatic Encephalopathy (CTE) is a degenerative brain disease found in athletes, military veterans, and others with a history of repetitive brain trauma. In one situation, he was said to be threatening people at a hotel with a gun. In another, he reportedly tried to break into one of his teammates' homes, which he later revealed wasn't true. He also got aggressive with Vikings staff during practice and was sent home. When asked about his bizarre behavior, he responded, "God made me do it." His wife also shared details about how her husband has been acting strangely, revealing he "awoke in the middle of the night on Sept. 16 and left the home" and that Griffen does that "at times when he is fighting 'demons' in his head." According to a Minnetrista, Minnesota, police incident report, Les Pico, the Vikings' executive director of player development, told police that Griffen had been "explosive, screaming and yelling" at the team facility and that he had been struggling in recent weeks. Vikings director of security Kim Klawiter told police that the team told Griffen not to play Sunday against the Buffalo Bills and to "go get his head straight." When Griffen reported to the team facility for practice Saturday, he was sent home. The incident report indicated that Pico also told police that team management had sent Griffen and his agent a letter last Thursday that stated Griffen would not be allowed back with the team until he underwent a mental health evaluation. Sources told ESPN's Courtney Cronin that such a letter was never sent to Griffen or his representatives. A league source told Cronin that Griffen was told by the Vikings not to worry about practice last week or the Bills game and to instead place his focus on getting himself help. The source indicated that both sides were in agreement that Griffen would stay away from the facility until he was in a better mental state. At no time, sources said, was Griffen banned from the Vikings' training facility. Pico told police that Griffen, 30, had not done or said anything that led the team to believe that he was a danger to himself or others. Pico said he intended to meet with Griffen on Saturday at Hotel Ivy, where Griffen had been staying. Pico told police that upon meeting Griffen at the hotel, the defensive end forgot why he wanted to speak to him and did not want to talk to him anymore. According to a separate incident report obtained earlier Tuesday by ESPN, authorities from the Minneapolis Police Department were called Saturday to Hotel Ivy because an individual was threatening to shoot someone if he wasn't allowed in his room. Following the incident at the hotel Saturday, Griffen allegedly attempted to break in to the home of teammate Trae Waynes before climbing into a stranger's truck and being driven to his home in Minnetrista, according to an incident report. "To clarify, there was no attempted break-in at our home and at no point did my family or I feel unsafe. We are friends with the Griffen family and we are here to support them in any way possible during these trying times," he said. Minnetrista Police then met with Griffen at his home. Asked by police why he went to Waynes' home, Griffen said that "God made me do it" and later agreed to go to the hospital. The reporting officer placed a health and welfare hold on Griffen "based upon his actions and information I had acquired about him." We pray he gets the help he needs to live peacefully and with a clear mind. In very tragic news, LSU basketball player Wayde Sims was shot and killed in Baton Rouge. The 20-year-old college basketball player got into an altercation outside of a Subway restaurant (across from Southern's football stadium). Video was captured and it showed several men fighting in the street. Next thing you know, a gunshot was heard and Sims was seen falling to the ground. The Baton Rouge Police Department has arrested Dyteon Simpson for the fatal shooting and has charged him with second-degree murder. Police said Saturday that Simpson dropped his glasses during an altercation early Friday morning involving Sims. The glasses were tested for DNA, helping police to arrest Simpson. "On behalf of LSU, I would like to thank the Baton Rouge Police Department, East Baton Rouge Sheriff's Department, the District Attorney's office and all law enforcement involved in this case for their hard work, diligence and pursuit of justice," LSU athletic director Joe Alleva said Saturday in a statement. 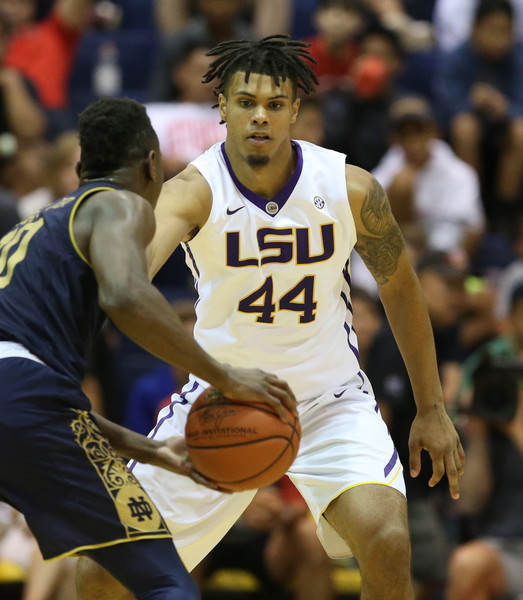 "Along with LSU Athletics, the entire LSU family continues to mourn the loss of Wayde Sims. Our thoughts today are with his family, friends and teammates." Sad and senseless. Prayers up for Wayde Sims' family, friends and fans. NEXT: YBF ENGAGEMENTS: Pregnant Porsha Williams Says YES To Her Baby's Father (And A 13 Carat Ring)!